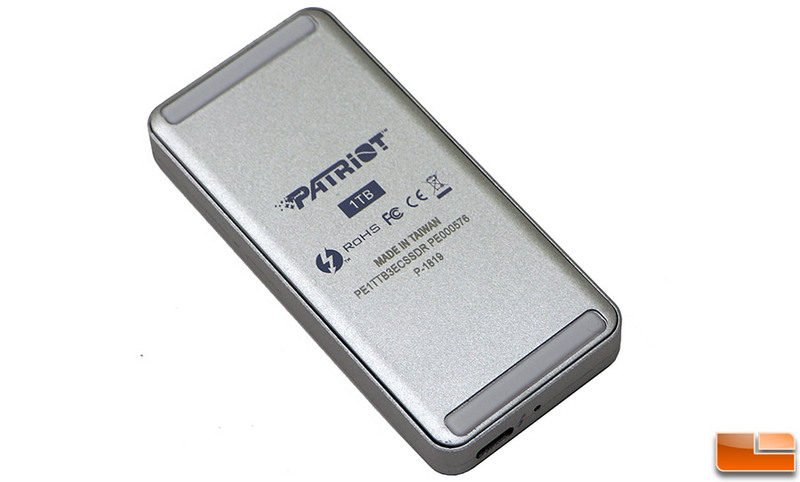 The first Patriot EVLVR Thunderbolt 3 portable SSD prototype was first revealed at CES 2018 and got some buzz as it is one of only a handful of external SSD solutions aimed at mainstream users that uses the Thunderbolt 3 interface. The name “EVLVR” is an abbreviation for “evolver”, as Patriot sees this drive being a major evolution in SSD technology. 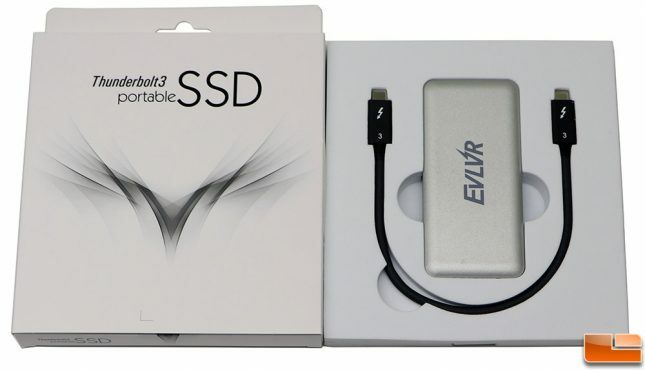 Supporting both Mac and Windows PC systems, the EVLVR is aimed at content creators, gamers and just the average user that is looking for a portable drive to move around data around as quickly as possible. The Patriot EVLVR was designed to be that solution and it will soon be available in 256GB, 512GB and 1TB capacities for $199.00, $289.99 and $489.99, respectively. We said soon as the EVLVR is entering mass production right now and will be launched worldwide in Q3 2018. Thanks to the Thunderbolt 3 interface and internal M.2 PCIe NVMe SSD, the EVLVR external storage solution is able to provide users with transfer speeds up to 1,500 MB/s read and 1,000 MB/s write! Thunderbolt 3 is expected to become more popular in coming years as it can handle data transfer at up to 40Gbps (5000 MB/s), potentially four times as fast as USB 3.1 Gen 2 at 10Gbps (1250 MB/s). Thunderbolt 3 is capable of 100 Watts of bi-direction power, so the Patriot EVLVR doesn’t need an external power supply since it uses much less power than this. For this review we will be taking a closer look at the Patriot EVLVR 1TB that runs $489.99 shipped. Our loaner review sample is one of only two completed models and was sent over to help raise awareness of the product. The EVLVR 1TB drive has an endurance rating of 600 TBW and is backed by a 3-year warranty. For those interested in the lower capacities models, the 256GB drive has an endurance rating of 200 TBW and the 512GB drive is rated at 400 TBW. The retail packaging is nice and inside we found the EVLVR portable drive and a 10.5-inch long Thunderbolt 3 cable. It would have been nice if Patriot would include a USB-A to Type-C cable, but when we tried using the drive with an adapter we already had it didn’t work. A message popped up on the system saying that the device functionality might be limited and it while the drive was detected by our system, the volume was not accessible. The Patriot EVLVR needs the power from a true Thunderbolt 3 port, so this is why only a USB 3.1 Type-C to Type-C cable is included. If you are trying to use the EVLVR on a system that doesn’t have a Thunderbolt 3 connection, you’ll need to use a dongle or adapter (which may have a negative impact on performance). The Patriot EVLVR measures 102mm x 48mm x 14.4mm (LxWxH) and is easily portable. On the back of the enclosure you’ll find the capacity and what looks to be a serial number that has been laser etched onto the housing. Under the two rubber pads on the bottom of the EVLVR are three screws that can be removed to access the guts of the portable SSD. 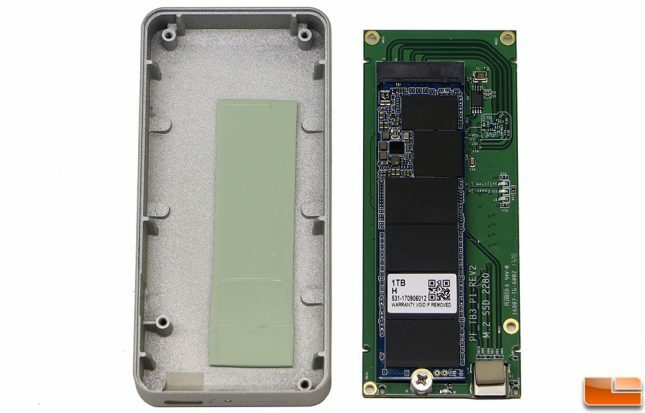 Inside the Patriot EVLVR 1TB Thunderbolt 3 portable SSD we found a 1TB M.2 PCIe NVMe SSD that uses the Phison PS5008-E8 controller with Toshiba BiCS3 64-layer TLC NAND Flash memory. The Phison E8 controller is a very popular controller for the budget NVMe market, so we aren’t too shocked to discover that it has made its way into portable SSDs. Patriot has a piece of thermal tape that covers all the components on this M.2 drive, so the aluminum enclosure is effectively one very large heatsink. We really like this design as the M.2 drive can likely be switched out if the need ever arises to do so. On the back of the PCB we discovered the Texas Instruments TPS65983 USB Type-C and USB Power Deliver Controller, Power Switch, and High Speed Multiplexer for Thunderbolt 3 devices. This is a pretty straight forward product, so let’s take a look at some performance tests to see how fast this Thunderbolt 3 device is on our Dell XPS 13 laptop.